The Verona Series Chess Pieces adhere to the traditional Staunton design, nuanced romantically with Shakespearean motifs. The bishop, for example, holds the classic shape but has been turned in a way that evokes the tulip shape of the Renaissance. The King and Queen, too, are heavily set with fortress-like, cylindrical tops common of the era. Over in Italy where the metal pieces are hand turned, the craftsman have taken care in detailing the knight’s features, bringing the piece to life with a cropped mane, muscular head and thick bridal. The lighter pieces within the Verona Series have been hand turned from solid Brass, while the darker set is covered in a layer of rustic nickel. The King’s base diameter is 0.9 inches and so fits neatly on boards with playing squares of 1.6 inches and above. 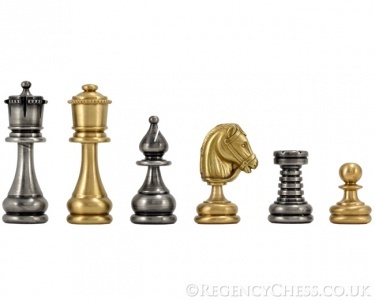 The ideal board for the Verona Series Metal Chess Pieces would be around 17 to 18 inches long.